As a guitar player, you’ll spend a good deal of your time playing accompaniment. Strumming Guitar Chords Rhythmically to support a vocal or instrumental melody. And while lead guitar players tends to get all the glory, it’s the rhythm guitar parts that are the backbone of songs. The problem is that learning how to strum guitar is like learning a complex foreign language for many beginning guitar players. Guitar Strumming feels like an awkward fumble of chewing gum, hopping on a pogo stick, rubbing your stomach and patting your head all at the same time. And even if you have become comfortable with some of the basics of strumming guitar, getting beyond those fundamentals seems to be an impossible task. …so cool songs go unplayed as you seek out only the easier ones that you can plug your favorite simple guitar strums into. Sure, there are many beginner guitar books and courses that talk about strumming. But if you already own any of them, you know they can be a little short on specifics. …or the pieces of your guitar smashed in strumming frustration frenzy. No, there is an easier way. And it’s a step-by-step system that has been developed over the last 35+ years of teaching hundreds of private guitar students the mysterious craft of strumming guitar. Hey, my name is Shawn Bradshaw. 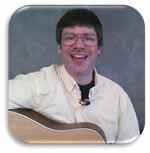 I’m the founder of Cyberfret.com, and your guitar teacher for The Rhythm Guitar Mastery course. Besides teaching hundreds of thousands of students from around the world on Cyberfret.com since 1999. I’ve also taught over a thousand private guitar students over the last 25+ years. 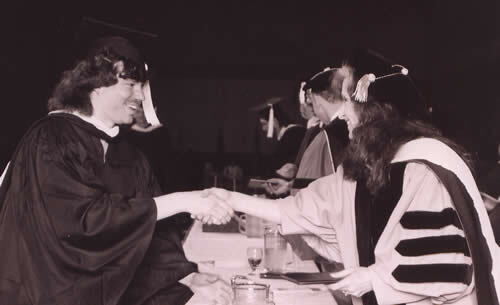 And I can’t leave out the picture of me receiving my Bachelor of Music degree from Berklee College of Music. Here’s me with 9 time Grammy Award winner Bonnie Raitt. Sportin’ the oh so cool early 90’s mullet of course. And while my college music education definitely helped me. It’s really my experience of teaching thousands of other guitar players just like you..that is going to help you. …but let’s take a look at another important part of the rhythm guitar equation. Why Learn Chords? Because they’re a core part of playing songs. You’ll find the same common chords and progressions keep coming up over and over. So learn them once, and you’ll be able to instantly play new songs that contain them. But learning and remembering chords can be difficult unless you have an organized way to practice and review them. This course also covers all the guitar chords you’re going to need to play all kinds of songs. Major, Major 6, Major add 9, Major 6/9, Major 7, Minor, Minor add 9, Minor 6, Minor 6/9, Minor 7, Minor/Major 7, Dominant 7th, Diminished, Diminished 7th, Augmented, sus2, sus4, 7sus2, 7sus4, and Power Chords. With each new chord you learn, you’re given multiple chord progressions to practice so you can embed them in your fingers and brain. Jam Tracks are also provided to help with timing, and make things fun. The chords you’ll learn in Rhythm Guitar Mastery will tie directly in with all of the strumming ideas you will be learning. …and this course will take you by the hand, leading you down the shortest path to get you to where you want to go. 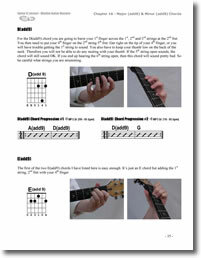 Understanding guitar strumming means understanding rhythms…and not just as words in a text book. But as an out there in the real world skill. Besides chords, rhythms are the other key piece of the puzzle. Even though there are an infinite number of rhythmic combinations in music..they can be broken down into just a few common patterns that can be connected together like Legos. Once you have your collection of Legos, you can easily build anything you need. This course gives you these small rhythmic building blocks in a systematic way. So before you know it rhythm confusion is a thing of the past. 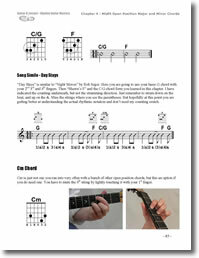 It also contains a complete library of guitar strumming patterns. So gone are the days of being stuck in a strumming rut. Combine together chords with rhythms and you can literally play thousands of songs. 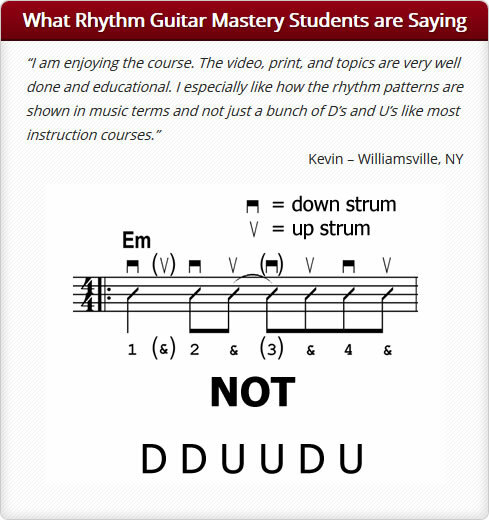 So what is the Rhythm Guitar Mastery Phase course all about? Below is a breakdown of what you’ll learn. If you’re new to the guitar this first chapter will get you up in running quickly. Learn the basic parts of both an electric and acoustic guitar. Learn multiple common way to hold the guitar both in a sitting and standing position so you can avoid some common nasty wrist pain. Learn the best way to hold a pick…so it doesn’t go flying across the room or end up inside your acoustic guitar. Learn good basic left hand fretting technique so you can easily play notes and chords avoiding pain. Learn how to tune the guitar by ear, and with an electronic tuner. 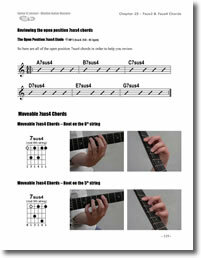 Learn how to read guitar chord charts, and learn your first really easy chord. Learn the fundamentals of music like what a staff is, measures, and learn your first rhythms…quarter notes and half notes. Learn how to read Guitar Tablature so you can start playing all kinds of cool guitar riffs right away. Get your fingers into shape with a must know finger exercise so you can build the strength and stamina necessary to play different chords and songs. This is another primer chapter for beginning guitar players. 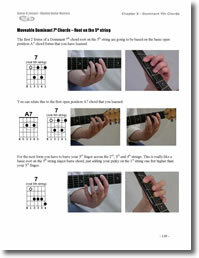 Learn the best chord fingerings for the easiest chord transitions. You’ll learn 3 must know chord troubleshooting tips to help you get a nice clean sound with your chords. Learn how to do “pinky push-ups” to help strengthen your 4th finger so you can easily play chords that use it. Play 20 chord progressions along with 60 jam tracks in different styles to help you master these 9 basic chord forms. Continue to systematically build your rhythm vocabulary by learning about dotted half notes, whole notes, 4/4 and 3/4 time signatures. Learn 2 undercover exercises to help you learn how to switch between chords quickly. The first 2 chapters cover some must know fundamentals, but the meat of the Rhythm Guitar Mastery course starts in Chapter 3. Chapter 3 is packed full with the basics of strumming. Once you learn these guitar strumming basics you will be able to play all kinds of songs quickly and easily. Continue building your rhythmic arsenal by learning about 8th notes, dotted quarter notes, ties, 8th note triplets, swing 8th notes, and accents. 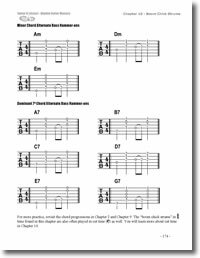 Learn six essential 2 beat 8th note strum building blocks. You’ll be surprised how much music is derived from these 6 easy to learn patterns. Learn 15 eighth note strum patterns in 4/4 time using both straight and swing 8th notes. Learn 6 eighth note strum patterns in 3/4 time using both straight and swing 8th notes. All guitar strum patterns are written using traditional rhythmic strum notation, and include exactly where to strum down and up. So anyone can easily learn these guitar strums even without understanding how to read music. Play along with 24 great sounding jam tracks to make practice fun, and help you master your new guitar strums. Start playing real music with songs in the styles of Lynyrd Skynyrd, Nirvana, America, Jewel, Semisonic, and the Cranberries. Easily apply what you learn to playing songs from the bands and artists you love. Learn the secret trick to being able to transition between chords quickly when strumming. (Yes, this is very rarely taught. WARNING: If you don’t learn this you are DOOMED to never being able to smoothly strum and switch between chords). Learn how to practice with a metronome so you can develop a good sense of time. 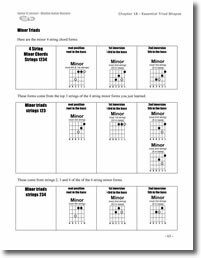 Learn a guitar strumming exercise that will help you play any strum you want by ear. In this chapter you’re going to learn some extra basic major and minor chords that were not covered in Chapter 2. Learn a special form of a G chord and 5 other easy cool sounding guitar chords that you can instantly combine to create your own songs. These are the Money Chords. Many hits have been written using this magic set of chords. 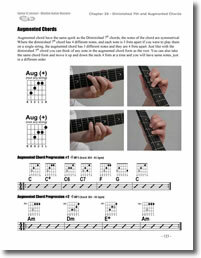 Learn other forms of A & C.
Learn the Jimmy Page F Chord. Learn how to play an open position Cm, Fm and Gm chord. Learn a little Bob Seger rhythm guitar strumming…Night Moves style. Learn 36 easier alternative fingerings for some of the more difficult major and minor chord forms. If your fingers are not cooperating with you yet, these 36 chord forms will be a life saver when playing songs as a beginner. Learn how to stop unwanted strings from sounding in your chords using 3 different string muting techniques. Learn about rests, which is silence in music. You’ll learn about quarter rests, half rests, dotted half rests, whole rests, and 8th rests. You will learn how to stop the strings using both your right and left hands. 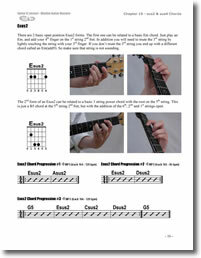 Learn six 2 beat guitar strum building blocks that use rests. Put your 8th rest knowledge to the test by jamming in the style of the Clash. Are you ready to ROCK! OK, Power Chords are used in more than rock music, but they are “THE ROCK GUITAR CHORD”. Learn about movable chord forms. Learn the 9 essential 2 & 3 string Power Chord forms. Learn 2 exercises that will help you move between different power chord forms quickly. Learn an essential power chord transition technique. If you don’t learn this one, you will always wonder how the pros move between power chords without pausing. Put your power chords into practice by playing in the styles of The Beatles, Blue Oyster Cult, AC/DC, Blink 182, & Bush. Learn about a very important rhythm guitar technique called Palm Muting. Learn a type of power chord with an altered bass note that gives a much more thick and even “menacing” sound. Learn an essential guitar technique called a slide, and apply it to movable power chords. Learn 7 open position Power Chords. 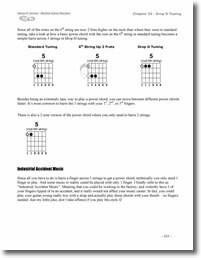 Practice your power chords with all kinds chord progressions and jam tracks. Learning the names of the notes on the neck of the guitar is key to knowing where to play certain chord forms. This chapter gives you all the short cuts to learning the neck. Master the names of the notes on the 5th and 6th strings in a short period of time so you can easily use power chords and other movable chord forms. Learn how to use fret markers so you can easily navigate the neck of the guitar. Learn how to line up Movable Chord Forms with the notes on the neck of the guitar so you can quickly go to the chords you need. Learn an easy trick to help you quickly find the names the notes on the 4th, 3rd and 2nd strings. Many new guitar players curse these chords, but not you after learning the material in this chapter. Learn movable major and minor “Barre Chords”. Master playing Barre Chords with 11 chord progression and 22 jam tracks. Learn how to build up strength in your left hand to help make Barre Chords much easier. Dominant 7th chords are very common in Blues, Country and Rock music. Learn 11 basic open position Dominant 7th chord forms. Learn 5 must know movable Dominant 7th chord forms. Practice with 28 chord progressions with jam tracks to help you master these Dominant 7th chord forms. This chapter is dedicated to a guitar strumming style that is used a lot in Bluegrass, Traditional Country and Folk music…and Rock that is influenced by those styles. Learn the basic “Boom Chick” Strum in 4/4 and 3/4 time. Learn how to use alternating bass notes to add interest to your guitar strums. A complete library of alternate bass choices is included to get you up and running fast. Practice your “Boom Chick” guitar strums by playing songs in the style of Crosby, Stills, Nash & Young and James Taylor. Learn how to add some more rhythmic spice to your Boom Chick Strums by adding 8th notes. 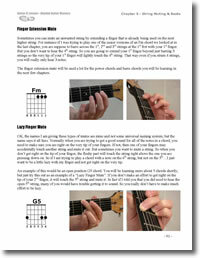 Learn how to play bass note runs (walk-ups and walk-downs) so you can add movement and interest to your guitar strums. There is a library of 32 done for you bass runs that you can easily plug right into your guitar strumming. Learn how to play hammer-ons and pull-offs and apply them to boom chick strums. Learn 15 of the coolest hammer-on guitar strumming patterns. Learn how to add percussive sounds into your guitar strums to add a new dimension to your playing. 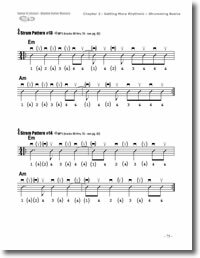 Learn how to play Back Beat Strum Patterns to imitate the sound of playing with a drummer. Learn how to use anticipations or pushes to give your guitar strums rhythmic emphasis. Continue to build your rhythmic vocabulary by learning about 16th notes and dotted 8th notes. Learn six essential 1 beat rhythmic building blocks that use 16th notes. 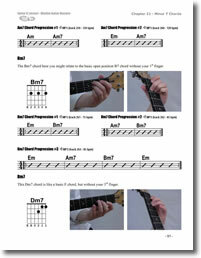 Multiply your 16th note guitar strumming by learning 36 two beat strum patterns with ties. Learn how to play the 5 most common 4/4 16th note guitar strumming patterns that are used in thousands of songs. Learn about 16th note push strums so you can add momentum to your guitar strums when switching between chords. Expand your 16th note strumming arsenal by adding percussive guitar strums. Learn the most essential metal rhythm guitar strum called “the gallop”. Put your 16th note guitar strums into practice by playing songs in the styles of Led Zeppelin, Jack Johnson, Heart and Iron Maiden. 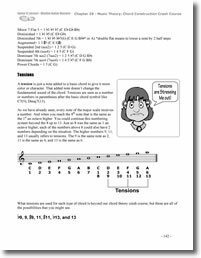 Continue building your rhythmic vocabulary by learning about 8th note triplets, quarter note triplets and 16th note triplets. 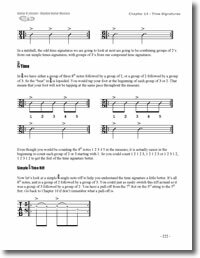 Learn 14 triplet rhythmic blocks. Put your triplets into practice by playing songs in the styles of Metallica, and Green Day. If you’ve ever been confused about time signatures, this chapter will put that behind you. Fully understand all about time signatures once and for all. Learn the basics of how time signatures work. This is where most courses end, but this is just the beginning. Learn about Cut Time, and a quick and easy “cheat” that will have you playing in cut time without learning anything new. Understand what simple time signatures are. Learn how to decode the sometimes confusing subject of Compound Time Signatures. Learn how to play in 3/8, 6/8, 9/8 & 12/8 time easily. Learn 4 of the most common building blocks that will help you get by in any 6/8 or 12/8 strumming situation. Practice your 6/8 strum patterns with a song in the style of the Moody Blues. Learn all about simple and compound odd times signatures (5/4, 7/4, 5/8, 7/8 and 11/8). If you like bands like Tool, Dream Theater, Rush, Kansas, Radiohead, or Coheed and Cambria. Learning about odd time signatures is a must. sus2 and sus4 are great sounding chords, and probably the next most common found in popular styles of music after Major, Minor and Dominant 7th. These chords are often used as substitutes for either major or minor chords giving a much more modern sound. Learn 19 sus2, and 17 sus4 chord forms. Systematically practice your new sus2 and sus4 chords with 52 chord progressions with jam tracks. Learn a song in the style of Gordon Lightfoot…did you pass the age test on that one 🙂 I had to throw in the first song I ever learned, and my first chord was Asus2. Major and Minor (add9) chords are really just more “spicy” major and minor chords. These chords are used all the time in thousands of different songs. These chords can also be used as substitutes for basic major and minor chords as well. Learn 16 major (add9), and 15 minor (add9) chord forms. Master your major (add9) and minor (add9) chords with 34 chord progressions with jam tracks. Slash chords. Even though the name sounds violent, these chords are actually quite peaceful 🙂 A slash chord is just a chord with a bass note other than the root. Chords like A/C# or G/B. Alternate Bass Note chords are used all the time in different songs…and are played incorrectly by many guitar players. But not you after going through this chapter. Learn how to Decode Slash Chord Symbols. Learn about Chord Inversions and Hybrid Chords. Learn 36 major and minor slash chord forms with 9 chord progression. Play along with cool sounding jam tracks to embed these must know slash chord forms into your brain and fingers. Learning these groups of 3 and 4 string chord shapes will really take guitar chord vocabulary to the next level. 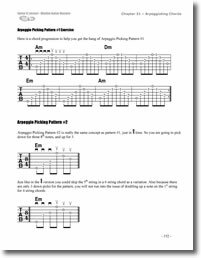 The chords you’ll learn in this chapter are great for 2nd guitar parts. They’re also used all the time in Reggae and Ska music. 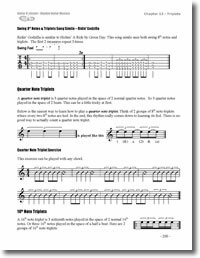 Learn 11 major, 10 minor, 6 sus2, and 8 sus4 chord forms. Learn about Voice Leading, and how this technique can help you create guitar parts. Have fun with some major and minor triad chords shapes by playing a song in the style of The Might Mighty Bosstones. Learn how you can combine the triad chord forms in this chapter with different bass notes to build literally hundreds of different slash chord forms. 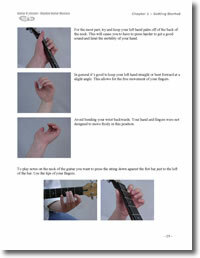 A capo is a clamp you can use at different frets on the guitar to change the pitch of the open strings. A capo can be used to put songs in easier keys…with easier chords. But that’s just one use of the capo. Learn the difference between chord shape, and chord sound. Learn the 3 different types of capos available, and the advantages and disadvantages of each. You’ll learn the must know comfortable Guitar Keys, and how you can use a capo to put songs into those easier keys. 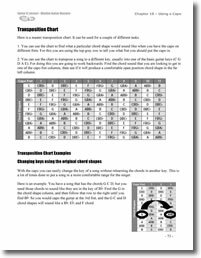 Learn how to use the included transposition chart to easily change songs into more comfortable keys, without knowing any music theory. 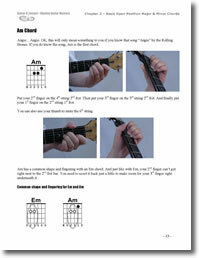 Use the capo to arrange songs for 2 or more guitar players. Learn the 2 common ways you will see guitar music written when a capo is used. These are some “purdy chords” 🙂 OK, my accent does not come through in the words…that’s “pretty chords” in plain English. While Major 7 Chords are used a lot in Jazz music, they’re also commonly found in more mellow Rock tunes as well. Learn 16 different Major 7 Chord forms. Practice with 16 chord progressions with jam tracks. Minor 7 chords are very common in all styles of music and can be used as a substitute for any basic minor chord. Learn 16 different Minor 7 Chord forms. Practice with 14 chord progressions with jam tracks. Minor 7 (b5) chords are especially used in Jazz music, but can also be found used by rock bands like Led Zeppelin, The Eagles, and The Stone Temple Pilots. Learn 7 different Minor 7(b5) Chord forms. Practice with 12 chord progressions with jam tracks. Major 6 Chords are just major chords with an added note. They are used a lot in Jazz as well as other styles of music. Learn 12 different Major 6 Chord forms. Practice with 17 chord progressions with jam tracks. Minor 6 Chords are used in Jazz as well as other styles of music. Learn 11 different Minor 6 Chord forms. Practice with 19 chord progressions with jam tracks. 7sus2 & 7sus4 Chords or like cousins to sus2 and sus4 chords and can often be used as substitutes and embellishment of those chords. They can also be used as substitutes for Dominant 7 chords as well. 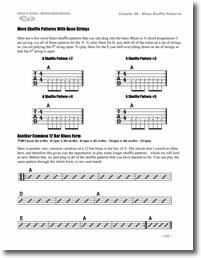 Learn 8 7sus2 and 10 7sus4 chords. Practice with 41 chord progressions with jam tracks. Diminished 7th and Augmented Chords are often found in Jazz and Blues music. Learn 3 essential Diminished 7th chords, with 3 chord progressions and jam tracks. 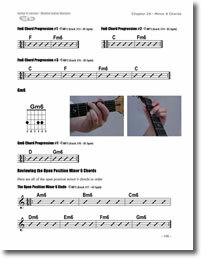 Learn 2 Augmented chord forms, and 2 chord progressions with jam tracks. 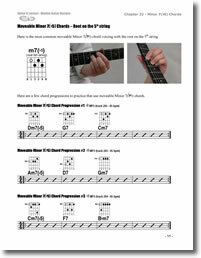 Previous chapters covered a lot of the basic guitar chords used in Jazz music, like maj7, m7 and m7(b5) chords. But this chapter introduces you to even more “jazzy” guitar chords. 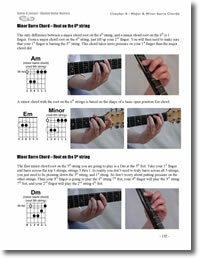 It also teaches you the fundamentals of strumming in a jazz style. 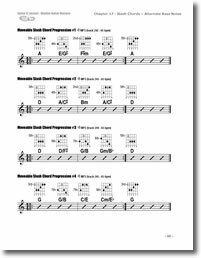 Learn 20 Cool Jazz Chords. All those chords with fancy numbers that the big kids use, like Cm7(11), D7(9), A7(#11). Learn 6 must know Jazz strumming patterns. Play 5 jazzy chord progressions with jam tracks. 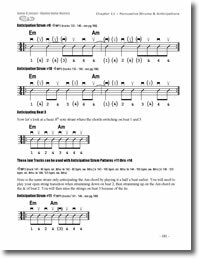 This chapter covers the fundamentals of playing Blues Rhythm Guitar. Learn a fun and very easy way to Play Blues Rhythm Guitar parts. 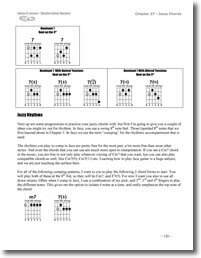 Play 8 great sounding blues shuffle rhythm guitar patterns. Learn how to play in the most common Blues keys, E and A. Learn how to easily transpose a blues chord progression in to any key. Learn how to jam on a cool blues shuffle pattern used by Jimmy Page from Led Zeppelin. Music Theory is the nuts and bolts of how music is created. In this chapter you will learn the basics to help you understand the chords you are learning in this course a little better. Learn where major scales come from. Learn how to build 3 and 4 note chords from scales. Learn about Chord Functions & Chord Formulas. 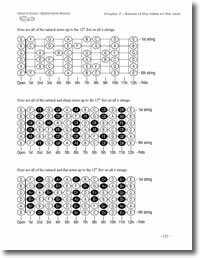 Learn about Chord Tensions like 9, 11 & 13. Many of the guitar chords found in this course can be used as embellishments or substitutes for other chords. This chapter helps you understand what chords can be swapped with each other. Learn how to substitute other compatible chords for major, minor and dominant 7 chords. Besides strumming chords, another very common guitar accompaniment style is to arpeggiate different chords. Basically playing one note at a time in a chord rather than strumming all of the notes at the same time. Learn common ways to pick out individual notes in chord to create different accompaniment patterns. Learn how to play “House of the Rising Sun” from the Animals. 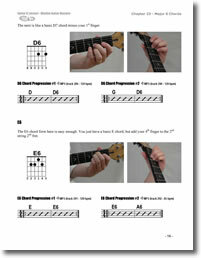 Drop D is a tuning that’s used a lot in modern rock music, as well as folk and fingerstyle music. Learn about natural harmonics and how to get into Drop D tuning by ear. 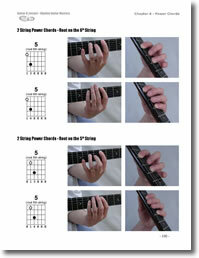 Learn an Ultra Easy Power chord that requires only 1 finger. Build your Drop D chord vocabulary with 51 cool chord Forms. So now you know what I’m going to teach you, but here is a list of the STUFF you will get with your course. The core of this course is over 24 hours of detailed video guitar lessons. I shot the videos for this course with 4 separate cameras. One in the center, one on my right hand, one on my left hand and the 4th is what I call the “Blimp Cam”. The “Blimp Cam” is a camera over my right shoulder looking down on my left hand. This is exactly what you would see when looking down at your own hand. Why 4 cameras? Because I knew it would help you learn the material faster. You will be right there in the front row, and looking right over my shoulder in the optimal place every step of the way. 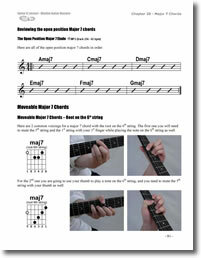 I’ve also included all of the examples, exercises and chord charts up on the screen. So you can see what I’m playing on the guitar, and the notation all at the same time. The videos are available in a digital download format. The video download files are in .m4v (h.264) format for all you geeks out there 🙂 They are playable on your computer with Apple’s Quicktime Player, iTunes or VLC Media Player (All Free) These videos are playable on both a Windows PC and a Mac. Chapter markers are included to quickly jump to different topics in a video. 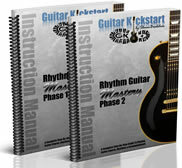 The 236 page & 180 page instruction manuals are packed with step-by-step written guitar instruction. These books covers all of the material in detail and stand on there own to help you learn the topics…even without watching the videos. 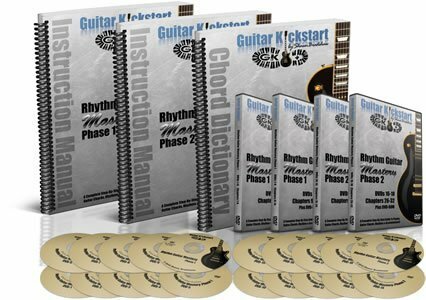 These books are packed with chord charts, music examples, rhythm building blocks, full guitar strum patterns, pictures of my hands from the front and above…and much more. 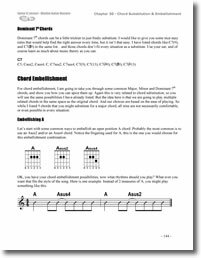 Specially formatted Kindle friendly PDF files are also included for each chapter so you can take the manuals anywhere, and even plop your Kindle up on a music stand for easy practice. 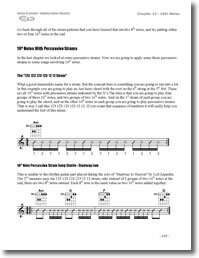 There are specially formatted PDF files with just the exercises that you might want to printed out for practice. The text explanations are left out of these files to save you some ink. Get jammin’ with over 4 hours & 22 mins of play-a-long fun. There is no better way to help get the material under your fingers than making real music with other instruments backing you. Give a listen to the samples below. This comprehensive 116 page resource is packed full of 1640 chord forms in Standard, Drop D, Double Drop D, Open D, and Open G tunings. (Most chord dictionaries only cover Standard Tuning) Learn Major, Major 6, Major add 9, Major 6/9, Major 7, Minor, Minor add 9, Minor 6,>Minor 6/9, Minor 7, Minor/Major 7, Dominant 7th, Dominant 7th(#5), Dominant 7th(b5),Minor 7(b5) Diminished, Diminished 7th, Augmented, sus2, sus4, 7sus2, 7sus4, and Power Chords. A metronome is an essential tool that improves your timing and builds your speed and control. Besides practicing with the Jam Track MP3′s, you will want to practice with this metronome. 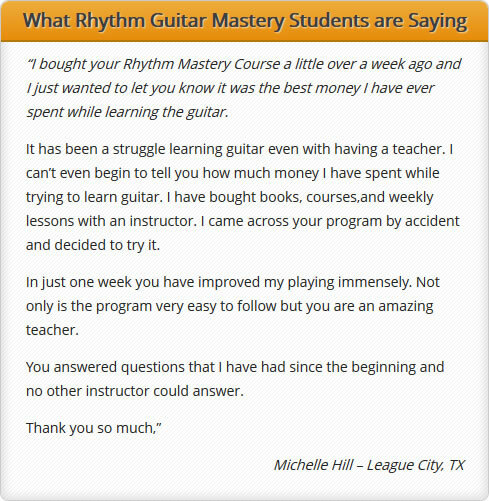 The Rhythm Guitar Mastery course gives you the vocabulary and tools to play songs. This book is going to give you a ton of resources to help you play songs from the bands and artists you love. From learning songs from printed music and tablature, to learning by ear. And discover the secret insider sources for the best free music on the Internet. I teach private guitar lessons, so I’m not going to tell you this course replaces studying with a good private guitar teacher. But I will tell you this. You will get more information in this course than you would if you spent thousands of dollars with a private teacher. The 24 hours of lessons alone would cost you $1200 at $50 per hour!! And with private lessons you don’t have the ability to look over your guitar teacher’s shoulder when you need to the most…when you are at home practicing the material. A private guitar teacher’s chicken scratches on a scrap of paper will not guide you in the same way this detailed and organized home study guitar course will. Or the online Chords 101 Course from my Alma Mater Berklee College of Music will cost you $1095! Try the course Risk Free…you have nothing to loose. I know this course will take your guitar playing to the next level… Guaranteed. In fact if you are not 100% satisfied with the course for any reason, just submit contact us within 60 days for a full refund. P.S. 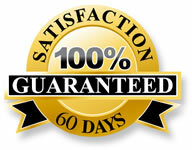 – Are you ready to Conquer Your Guitar Strumming Challenges once and for all. Try Rhythm Guitar Mastery Risk Free Today!